There are 24 posts tagged Carbon accounting (this is page 1 of 2). A company called Vision 2050 Forestry claims to be the “leading forestry company in West Africa”. According to the company, between September 2008 and February 2010 more than 300,000 people signed up to Vision 2050 Forestry’s Carbon Credit Project. The company claims that 150 million trees were planted and “five million people are expected to benefit from the project within the five years period as direct beneficiaries”. In June 2016, I wrote a post based on a paper published in the International Forestry Review titled, “The ‘virtual economy’ of REDD+ projects: does private certification of REDD+ projects ensure their environmental integrity?”. Double-counting: What if both Brazil and California want Acre’s REDD credits? Carlos Klink, secretary of the climate change unit at Brazil’s environment ministry, recently told Bloomberg that Brazil would use REDD credits generated in the country to meet its own emissions targets. Where does that leave California, which is considering using REDD credits from the Brazilian state of Acre? The Alto Mayo Protected Forest in the Peruvian Amazon covers about 182,000 hectares. Although it became a protected area in 1987, it remained under serious threat. Today it is the site of a REDD project run by Conservation International with funding from Walt Disney. There are plenty good reasons for not eating meat. Cancer, heart disease, diabetes, meat glue, pink slime, antibiotics, steroids, pesticides, heavy metals, salmonella, E. coli, mad cow disease and the inhumane treatment of livestock – to mention just a few. “Secondary forests are a major terrestrial carbon sink and reliable estimates of their carbon stocks are pivotal for understanding the global carbon balance and initiatives to mitigate CO2 emissions through forest management and reforestation.” This is the first sentence of a recently published paper in Forest Ecology and Management. What if tropical forest soils start releasing more carbon as global warming increases? 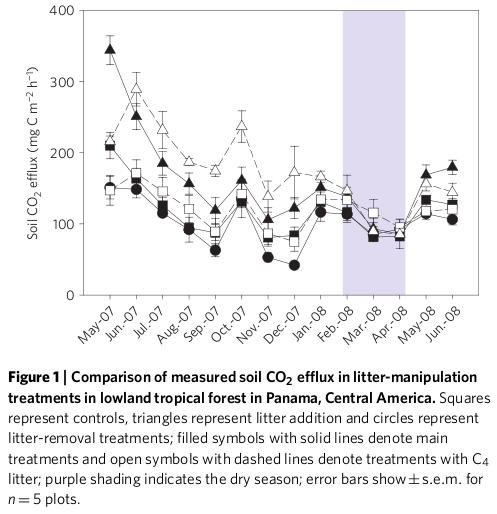 As the amount of CO2 in the atmosphere increases trees in tropical forests grow faster and more carbon is stored above ground in the increased forest biomass. But a paper recently published in Nature Climate Change suggests that we should take a somewhat less optimistic view of how much carbon might stored in forests as the climate warms. June 2011 has seen a wave of criticism of REDD in Central Kalimantan. On 8 June, a group of indigenous people issued a statement demanding a stop to the Australian-funded Kalimantan Forests and Climate Partnership. On 16 June, EIA and Telapak released a report documenting a Malaysian oil palm company clearing forest in Central Kalimantan apparently in breach of the country’s forestry moratorium. In the Road Runner cartoons, the coyote chases the road runner off the cliff and keeps going until he looks down. Once he realises what’s happened, he falls. Proponents of trading the carbon stored in forests are currently running coyote fashion as fast as they can towards the edge of the cliff. Two new reports look at REDD in Cameroon from slightly different perspectives. The first, by the Forest Peoples Programme, focuses on indigenous peoples’ rights in the REDD processes in the country. The second, by CIFOR, looks at context of REDD, including reference scenarios, mechanisms for funding, monitoring, reporting and verification and political reforms. The Top 10: What’s wrong with REDD? McKinsey & Company has benefited from a series of consultancies, advising governments about REDD. But a new report from Rainforest Foundation UK uses examples from McKinsey’s REDD advice in Indonesia, Guyana and the Democratic Republic of Congo to demonstrate that the advice McKinsey gives is based on flawed analysis and misleading for decision-makers.